For info on how to get the beads onto the yarn and which method I used to position the beads, see my earlier post. 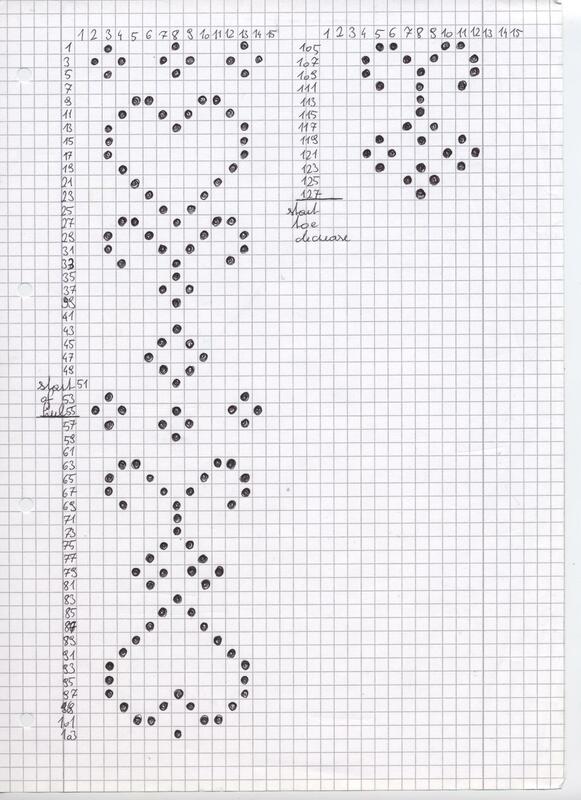 Bead Pattern: knit 3 rounds before working the chart below. Click the image for a bigger picture. (I’ll eventually redo the chart to make it easier to read) Only work the chart for every other round. The rounds inbetween (or even numbered rounds which arent shown on my chart) are knit. To position the beads I used the method of bringing the yarn to the front of the work, bringing the bead into position and just slipping (purlwise) the according stitch. For me it works best if I position the bead close to the last knit stitch before slipping the stitch. 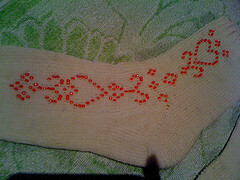 The pattern itself is worked over 13 stitches with 1 stitch as margin on each side. That puts the whole pattern on just one DPN and makes it quite comfy to knit. 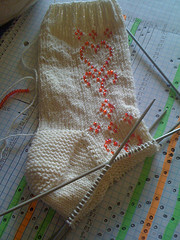 Start working your favorite heel after row 55 and continue with the pattern after the heel is done. 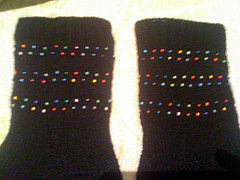 At the end of the pattern knit another 3 rows before starting the toe decrease. Today I finally cataloged the group recording of “Heimatlos – Geschichten fuer Kinder und auch fuer solche, welche die Kinder lieb haben” (roughly translated: Homeless – Stories for kids and also for those, who love them) by Johanna Spyri. She probably is best known for “Heidi”, but I love her other books too and will surely do a couple more for LibriVox in the future. 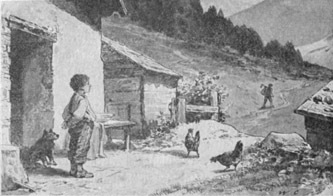 The book consists of two wonderful stories – “Am Silser – und am Gardasee” and “Wie Wiseli’s Weg gefunden wird” for kids. Both stories are about orphaned children. In the first it’s a little Italian boy, who goes out into the world because of a song his father used to sing and in the second one a little girl has to go and live with a relative after her mother dies… and though both stories are very sad at times they both have a happy ending. Acutally the first sock is almost finished by now, I just haven’t had time to take new pics. But there will be a couple soon. 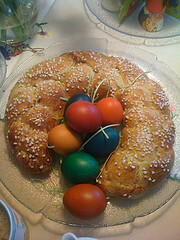 Before starting to knit put the beads on your yarn. If you do it with the same number of cast on stitches I used, each stripe requires 20 beads, so that makes 120 beads per sock. That’s quite a lot and working becomes quite tedious because you have to move all those beads along the yarn as you go. So after doing the first sock with all the beads on the yarn from the beginning, I only put half of them on the yarn for the second sock and just cut the yarn and added the rest after finishing the 3. stripe. k8 rows before repeating the bead pattern 2 more times (or till you have as many stripes as you like), work another 15 rows before working you fav. heel/rest of sock. 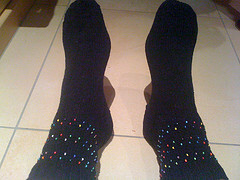 …and to show off the pair of knit socks I made. 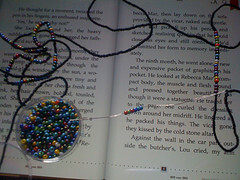 It’s the first time I worked with beads and I think they turned out wonderfully. I’ll do a proper post with details on how I knit them soon. The only thing I’m a little worried about is that the beads might not be washable…. that is, that they might loose their color when put into the washing machine.